I have a Paleo Pumpkin Pie Recipe that everyone will enjoy. When eating Paleo for the holidays it can be a little tricky but you don’t have to worry now. I don’t know about you, but I’ve found that eating Paleo during the holidays is HARD. It seems like everyone shoves anything in their mouths they want to without repercussions. If I were to eat just one bite of that type of food, I would feel horrible. Oh well. I figure it will all even out in the long run. How? Well, if nothing else, there’s a chance that when they are old and decrepit and can barely move, I’ll be old with plenty of energy and feeling just peachy. It’s possible. I really know it is. I really believe the Paleo diet is so good for our bodies for the long run (well, and the short run too). But back to the holidays. What to do about desserts. So someone asks you to bring pumpkin pie to a party. What do you do? Bring a pie you can’t eat or bring a Paleo pumpkin pie, like this? So hard to decide. I think it totally depends on the party. I usually end up making or buying what I’m asked and then bring along a few things I know I will be able to eat and that some other health-minded people will try. That’s how this pie came to be. I actually bought regular pies from a local bakery, because I didn’t want to spend my time making something I wasn’t going to eat. Also because I don’t even have a lot of “normal” ingredients in my house. Plus, you can get “normal” people food relatively inexpensive. Does anyone else think it’s ironic that the less stuff in something, the more it costs? But I wanted to bring something I could eat, so I developed this Paleo pumpkin pie recipe for me. I cook Paleo quite often for family parties and they don’t even know they are eating Paleo. But with something like a pie, it’s just not quite the same. Let’s put it this way – my dad can tell this pie ain’t normal and if it ain’t normal, he ain’t gonna eat it. A few of the women gave it a try though and liked it. Mostly women who are watching their figure and like that it’s lower in carbs and has healthier sugars than a normal pie. I like that I can eat it and hey if no one else wants to eat it – LEFTOVERS! I really like this crust. The almond flour goes so well with the pumpkin filling and I love how firm the filling is too – and just look at how pretty the coconut cream is on top! The crust for this Paleo pumpkin pie is super easy to make and involves only a few ingredients. The pumpkin custard is firm and full of autumn spice! The topping is made of a slightly honey sweetened coconut cream that goes so nicely with the almond crust. Place the almond flour and salt in the bowl of a food processor. Process for about 30 seconds. Add the coconut oil and egg to the processor and process until the mixture comes together in large crumbles. Place the dough in a 9” pie dish and pat the dough firmly and evenly around the sides and bottom of the pan. Cover the pan with a sheet of tin foil and bake in preheated oven for 15 minutes. Remove and let cool . Add the pumpkin puree, honey, coconut oil, pumpkin pie spice, coconut milk, and eggs to a large mixing bowl. Whisk together until smooth. Pour into the pre-baked pie crust. Bake at 350 degrees for 50-55 minutes, or until the top is slightly puffed and firmly set. Remove and let cool completely. Refrigerate. Place the firm coconut cream(this is the firm, white, creamy, thick coconut cream that rises to the top of a can of coconut milk. Do not shake it before opening. It may help to chill the cans before opening as well as some coconut milks don’t separate as well as others)in a mixing bowl along with the honey. Beat together with an electric mixer until smooth and creamy. Spoon or pipe on top of the chilled pie. 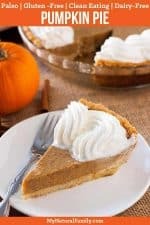 Here are 9 of the best ever Paleo pumpkin pie recipes for you to try out for Thanksgiving dinner this year. They are fairly easy too. You’ll be surprised how easy they are. Pumpkin pie is traditional at our house because my Dad thinks we have to have it. The truth is that a lot of us don’t like pumpkin pie, but he does, so we have it. Sometimes he might be the only one that eats it. At least now my sister-in-law loves it, so we have it for her too. Growing up my mother had pumpkin pie as a tradition for Thanksgiving every year too, but she didn’t eat it. Actually, after she got married she started liking it but then she started not liking it anymore. Aren’t we humans fickle? It’s the texture of the filling that she doesn’t like. Maybe she would like some of these Paleo Pumpkin Pie Recipes. I should make her one for Thanksgiving this year and see if she likes it. This truth is I think it’s an acquired taste. AND I think you have to have the right pie. They certainly aren’t all created equal. Some are hard and dry and some are running to watery. A good pumpkin pie needs to be cooked enough but not too much. remember my grandma would open the oven and stick the tip of a table knife in the middle of the pie filling. If the knife came out without any pie filling on it, that meant it was done. If it had some filling stuck to the knife, she would cook it a little longer. If the pie crust is looking like it’s going to be done before the filling you can use a pie shield for the crust which will keep it from burning and you can let the filling cook a little longer. Man, that sure seems like a handy little gadget to me. I’m going to have to get me one of those this year. Do you like chocolate pumpkin pie? I’ve never tried it but I’d like to know what you guys think about it. Let me know if you try it. 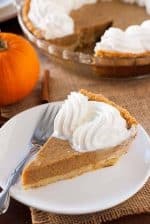 I’d like to know which of these Paleo Pumpkin Pie Recipes are your favorites. #1 is my favorite since I developed it and I love having the coconut cream on top. I prefer chocolate cream pie with coconut and walnuts and whip cream on top. What is your favorite kind of pie? Michele says that this pie tastes just a good as any traditional pie. I’m not sure I believe that, but hey let’s give it a try. I could be wrong. It sure does look good, doesn’t it? Thanksgiving is coming up soon, that would be a good time to try it. This pie crust turns out to be so light and flaky. It’s so much like a traditional pumpkin pie. It has just the right blend of almond flour and cassava flour. The filling is very similar to a traditional filling with only coconut milk replacing the condensed milk and maple syrup replacing the refined sugar. I think it’s important to have fresh pumpkin pie spices, if yours are a few years old, throw them out and buy new. It makes a big difference. This one is a little different since you basically make your own pumpkin pie spice mixture. It also had a bit of an almond flavor since it has both almond flour and almond butter in it. With the spices the way they are in the recipe, it is a little on the spicy side. If you like a more mild flavor, you can easily just use less of each spice. I would suggest cutting each spice in half for starters. Here is a super fast and easy pie to make for Thanksgiving or Christmas. It is simply made with pumpkin puree and dark chocolate. There is no baking, no dairy and no need for eggs. All you do is combine all of the ingredients together, let it cook for a few hours and then eat it. This pie also has it own spice blend with a link to a recipe for the blend. Coconut milk is substituted for the cream and honey is substituted for the sugar. The almond flour is easy to work with for the crust and the flavor doesn’t overpower the filling. Nut crusts are easy to burn to keep an eye on the crust while it’s baking. If it starts to get brown enough but the filling isn’t cooked yet, you could use a pie shield to prevent it from burning. Here we have a crust made with just dates, walnuts and cinnamon. Now that is what I call minimal and easy at the same time. You can put all the ingredients in the blender and have the crust ready in just a few minutes. You make the filling in the blender too and you don’t even need to wash the blender bottle before you make the filling. Super Super easy! You know how peanut butter and jelly go together. Well in my family Thanksgiving and pumpkin pie are like that. That is for my Dad and his family at least. When I was forced to start eating Paleo I was forced to make a good pumpkin pie that my Dad wouldn’t know was Paleo. Is your family like that? So steeped in tradition that nothing can change, at least for holidays like Thanksgiving and Christmas. What do you call a pumpkin pie that is gluten-free, dairy-free and also refined sugar-free? I could think of several words but the first that comes to mind are easy and healthy. I really like how there is shredded coconut on top. If you don’t want whipped cream on top, this is a good way to go. I’m going to have to try this for Thanksgiving this year! This looks like the perfect Thanksgiving Paleo pumpkin pie recipe. I’m going to try it this year. The pie looks great! But I learned that if you heat up honey it counts as normal sugar. It looses it’s benefits. Why don’t you use sugar or coconut sugar? Or leave the sugar aside all together? I’m curious. Maybe add some stevia sweetener? You could probably use whatever sweetener you like – I just haven’t experimented with other “sugars”. I like honey because of the taste. And I don’t believe that it counts the same as sugar. I feel way better after eating heated up honey than sugar or stevia. True that you may as well use regular honey instead of raw when heating it up though. . .
How many carbs per serving? And can you exchange the honey for stevia or another sweetner? Can you use a can of coconut cream instead of scooping the cream off of the top of coconut milk? Does this pie need to be kept in the refrigerator? That should be fine to use and yet keep it in the fridge. I love this recipe! I like it better than traditional pumpkin pie. The crust is thin and not soggy even after sitting in the fridge for a day! I added 1 tsp of cinnamon to the crust mixture. I’ll be baking this pie again for Thanksgiving. What did you use to put the whip cream on the pie? It is beautiful!!! I used my piping tube. You can use any tip you would want to.